Question For You All – What The Hell Is This? Home » News » Question For You All – What The Hell Is This? 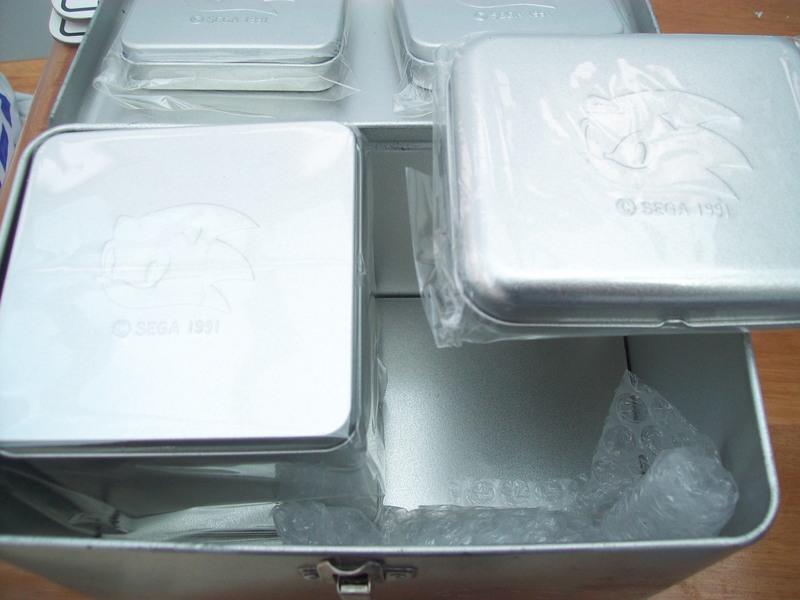 Presenting – one large lunchbox like tin, encorporating a large tin of about half the interior size and three smaller tins all about the size of a drinks coaster. The previous owner was Emerald Coast and Sonic Wrecks staffer Nemain but this has since been purchased by fellow dual-site staffer Vger. The only problem is he doesn’t know what it is. Now, you might well be aware that Nemain is quite the merch hoarder, probably second only to T-Bird in the UK/Euro community. She doesn’t know. T-Bird? He doesn’t know. Heck I don’t know and I’ve seen more rares up close than probably any of you. So WHAT IS IT? Apart from being a series of tins of course. It’s almost like a series of tea tins, but that doesn’t explain where it came from or why it was made. It’s got a 1991 copyright embossed on it but other than that we’ve got no clues, no packaging and no leads. It may be of Japanese origin, owing to where Nemain got it from initialy – but that is no gaurantee of course that was where it was produced. It’s certainly… unusual in both it’s design, function and practicality. Is there a way to check what it’s made of? Just in case there’s lead and it unconsciously poisons your food. I thought abut it hard and deeply and…..
I’ll go along with TRiPPY and guess that it’s a bento box. 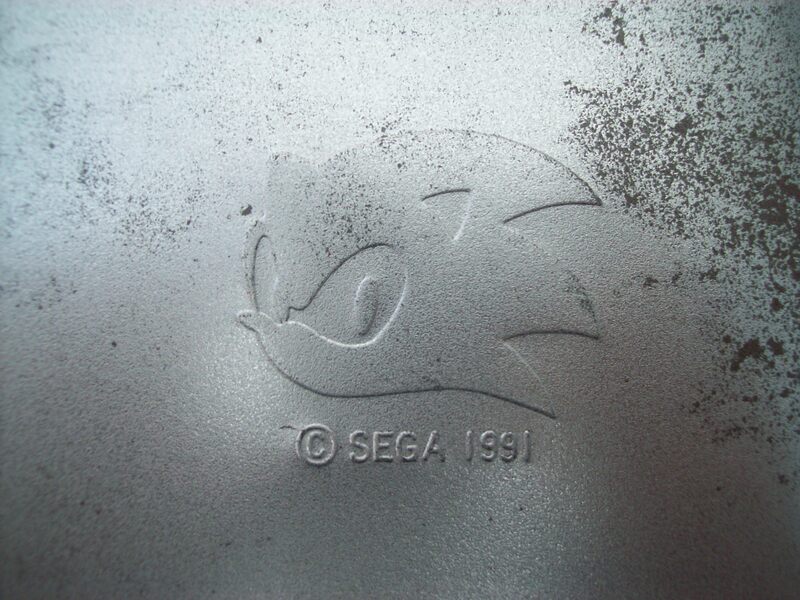 Certainly looks to be of Japanese origin, seeing as Sonic’s pretty on-model there. I think it’s one of 3 things. 1: A storage box for arts and craft things, like giant rubber ink stamps and various other craft related things. 3: A Sonic the hedgehog drug dealing kit. Maybe it’s some kind of time capsule from ’91. Well if it’s from Nemain then I’d say little zombie bits. But it’s passed through Vger’s hands so it must have been made to carry A MASSIVE WRENCH!… sorry, not funny at all I know. I’d say it’s to hold individual Mega Drive cartridges judging by the size of the little boxes inside. Good idea. 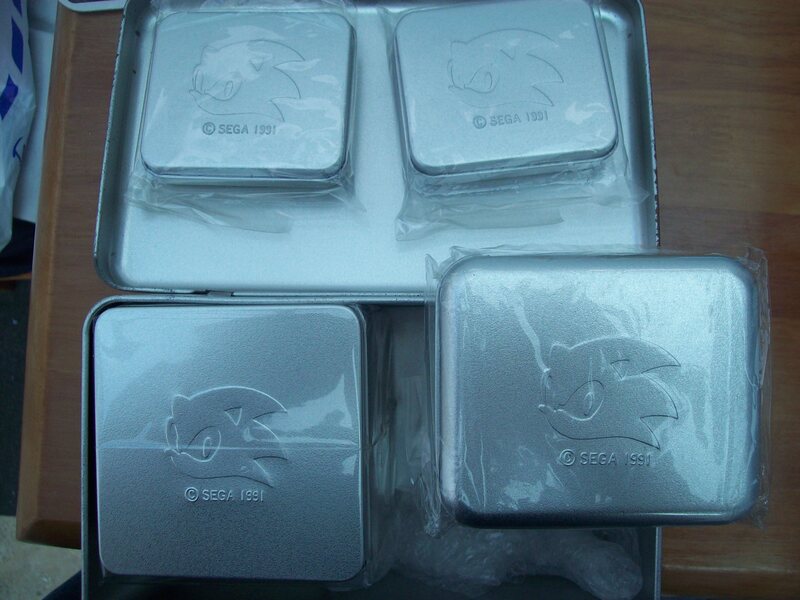 But MD/Gens cartridges aren’t as square-shaped…..
My personal thought is that it was a tobacco box. The little tins would be for cigars/cigarettes/papers, the deeper tin for loose baccy, and the big tin for carting it all round. Also: Nice idea, but those tins are way too small for games. They’re about 3″ x 3″ x 0.5″ in dimension. Although Jonathan’s idea may work. 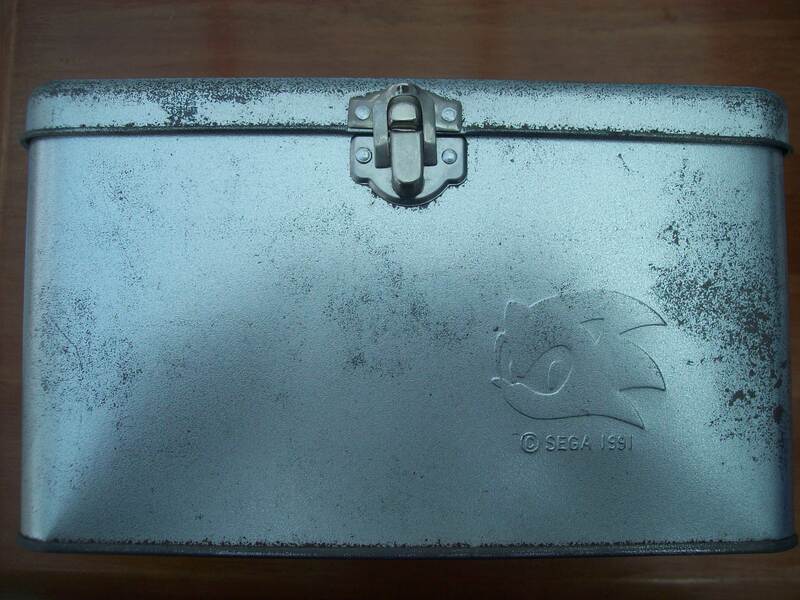 The box thing could have been a tobacco case for those who worked on designing Sonic or be for head SEGA personnel. That would also explain the rarity of this too. But I’m still not sure, maybe we could check with Sonic Gear or something. Personally I would have to guess it was used by SEGA itself. Possibly the SEGA of Japan. Being 1991 as all of us know was when Sonic made his first debut. Could have held some special items having to do with the first game, but doesn’t have them now being that maybe whoever had it last just found it rather pointless. Though this is a great find, I may have just guessed, but it sort of makes sense.